Catcher crushing ball for rejuvenated Ramblers. 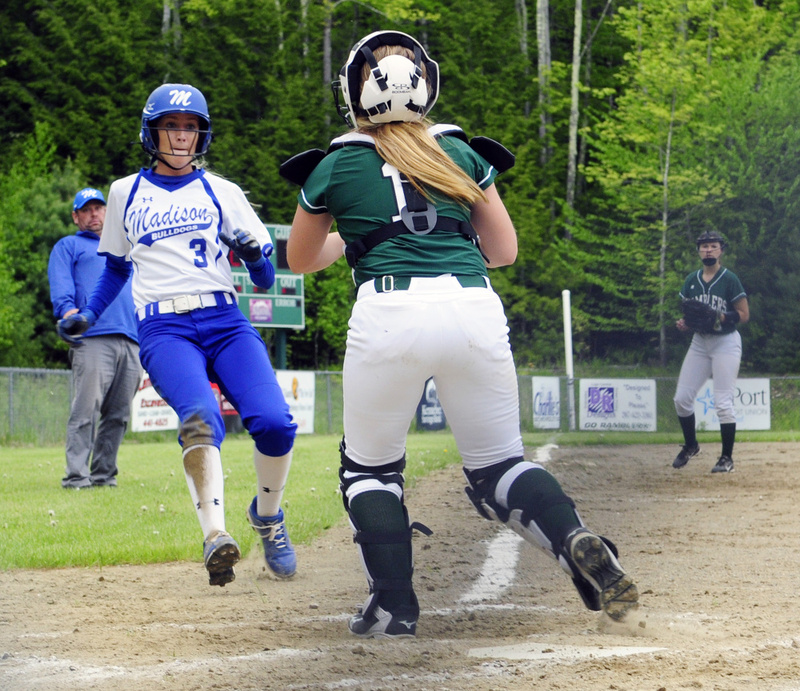 WINTHROP — It’s a pretty decent poke to clear the fence at Winthrop’s softball field. In fact, when Chuck Gurney took over as head coach three years ago, only one Rambler had done it. Then along came Kayleigh Oberg, a sophomore in Gurney’s first year. “The first time I saw her swing the bat I said she will hit one out,” Gurney said. Oberg has cleared that fence — and many others as well — with a smooth, left-handed swing designed as much for line drives as for towering moon shots. As she has improved along the way, so have the Ramblers. They went 3-13 in Gurney’s first year, one in which graduation took a heavy toll on the roster. Last year they improved to 5-11 in Class C South and gained a prelim game in the playoffs. This season Winthrop is a force in the South and the Mountain Valley Conference, having finished 11-5 and second in the standings as it awaits a playoff opponent later this week. Gurney certainly deserves credit for the team’s success but he deflects to Oberg, his senior catcher and team captain. “She’s been the driving force in my opinion,” Gurney said. The statistical evidence bears Gurney out. After batting .583 a year ago, Oberg improved to .615 this season with 32 RBIs and three home runs in 15 games, including one off Madison ace Madeline Wood. Those numbers alone would put Oberg into Gurney’s hall of fame, but there’s more. Sophomore pitcher Layne Audet has worked hard in the offseason on her speed and technique and had an ally in Oberg when she took the mound her freshman season. The first thing one notices above Oberg behind the pate is that she’s left-handed, unusual but not unheard of in softball. Being a southpaw has its pros and cons. On the down side, it’s more difficult to throw to third base with a right-handed batter in the box. Being a lefty does help on bunts or plays in front of the plate since Oberg doesn’t have to turn around to throw to first base. When Oberg made the team as a freshman, the Ramblers already had a top-notch catcher in Cat Ouellette so she played mostly right field. Oberg, who caught in middle school, watched her mentor in action before becoming the starter after Ouellette graduated. Oberg improved in every aspect defensively, Gurney citing her strong throws to bases and Audet her ability to stop pitches that are off target. “I know she can block everything that I throw,” Audet said. As much as Oberg enjoys being behind the plate, she likes being at it even more. Tow of her best high school memories are hitting home runs in Winthrop against Hall-Dale on consecutive years on breast cancer awareness day. “That is probably the best feeling playing softball,” she said. Oberg has played for Gurney and the Maine Thunder the past couple of summers and plans to return this year in preparation for attending the University of Maine at Farmington where she’s been recruited to play. Gurney is happy to have her for another summer. “It’s huge to have a kid like Kayleigh with younger kids,” he said. When Oberg isn’t playing softball she hones her martial arts skills. She’s holds a black belt in karate and has won state championships in forms, weapons and fighting. For now, her focus is on the softball field. The Ramblers will find out their first-round opponent following preliminary round games this week. “I honestly believe we have a team that can make it to states,” Oberg said.